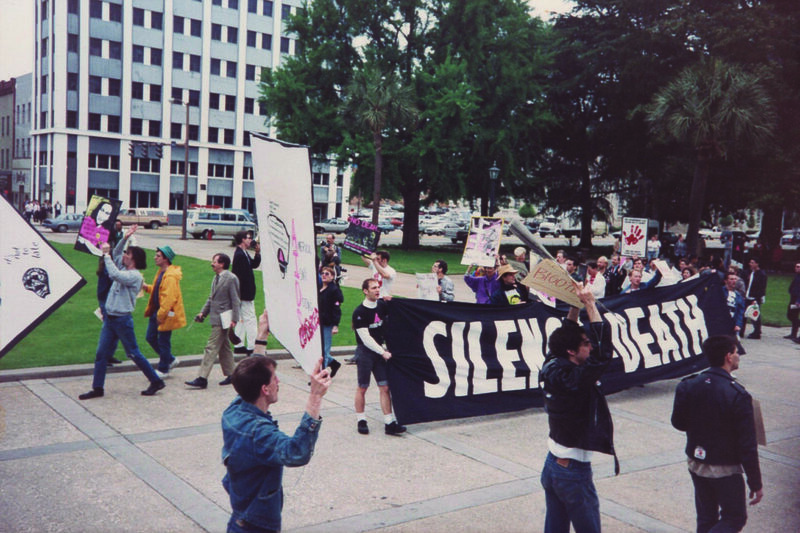 “Silence = Death” Sign at ACT UP Protest, 1989, Photo courtesy of DiAna DiAna. In advanced of the Nickelodeon’s screening of BPM, a film about ACT UP (AIDS Coalition to Unleash Power) in Paris, it is worth remembering that Columbia was the site of an important ACT UP protest in the early days of the AIDS epidemic. On Thursday, April 20, 1989, members from ACT UP’s Georgia and New York branches joined South Carolina activists to protest a 1988 state law that allowed forced HIV-testing, the quarantine of people with AIDS, and the expulsion of students who were HIV-positive. There was a “kiss-in” in front of the State House and a “die-in” at the intersection of Gervais and Main, blocking midday traffic and resulting in the arrest of 41 protesters. The protest focused attention on the demonization of people living with HIV and was a tipping point for local visibility. Within a few months, in the fall of 1989, organizers were planning the state’s first gay pride march. When the march took place the next summer, on June 23, 1990, participants spontaneously rushed up the steps of the State House where the march ended—staking claim for a political presence in the state. “OUT Here” is a community-curated film series celebrating milestones of LGBTQ cinema.